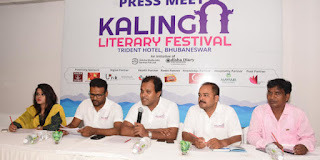 The 5th edition of Kalinga literary festival 2018 will be held in Bhubaneswar, Odisha. It will explore concepts of equality, equity and humanity in literature. It will witness innovative sessions on radio, poetry recitation, short story, lyrics and cinema by eminent speakers, writer, poets etc. Kalinga Literary Festival is an annual literary festival held in Bhubaneswar each year in the month of June. It was first was launched in 2014 to celebrate the Classical Language Status of Odia language. Kalinga Literary Festival is conducted to celebrate this creative spirit of the Smart City of Bhubaneswar and commemorate the literary diversity it offers. The festival has been founded and directed by Rashmi Ranjan Parida, an award winning journalist. The KLF is organized by Odisha Diary Foundation in collaboration with Odisha Diary news-portal and Odisha Living Legend Initiative. The theme for the last year KLF (KLF 2017) was ‘Literature for Peace and Harmony’.